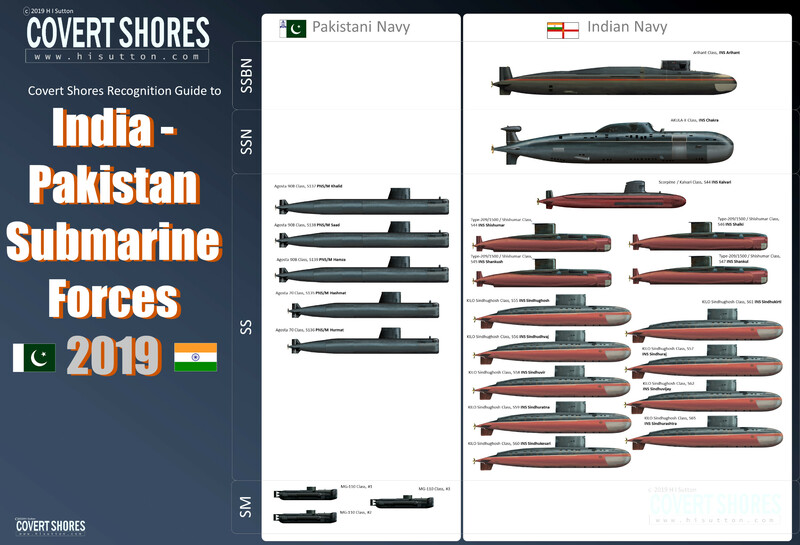 High-resolution poster of submarines in service with Indian ad Pakistani Navies. 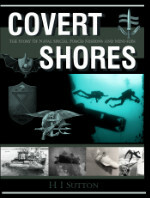 Both navies have strong submarine force traditions dating back to the Cold War. Pakistan’s first submarine was PNS Ghazi, and upgraded Tench Class ex-USN fleet submarine of World War Two vintage which joined the fleet in 1964. She was lost due to unconfirmed reasons during the 1971 War between India and Pakistan (Indian accounts credit the sinking to the Destroyer INS Rajput). Today the backbone of Pakistan’s submarine fleet are three AIP (Air Independent Power) equipped French built Agosta–90B boats. These are relatively modern and have reportedly been upgraded to launch locally developed Babur cruise missiles which gives them a potential limited at-sea deterrent capability. These boats are complemented by two older Agosta-70 boats and three Italian designed Cos.Mo.S MG-110 X-craft. The latter are intended primarily for transporting SSGN (Special Service Group (Navy)) commandoes and inshore intelligence gathering. They are armed with two heavyweight torpedoes and are capable of limited attack submarine duties close inshore. Pakistan is in the process of purchasing eight 039B Yuan class AIP boats from China, although the first delivery is not expected until 2023. There have also been reports that Pakistan is planning to replace the three X-Craft in the immediate future. India joined the submarine club a few years after Pakistan when she took delivery of four Soviet Pr.641 FOXTROT Class diesel-electric submarines in 1967-69. These were followed by four more of a modified variant, followed by ten of the much more modern Pr. 877 KILO Class in the 1980s, nine of which remain in service . Today India’s submarine fleet dwarfs Pakistan’s and includes two nuclear-powered and one nuclear-armed boat. The headline class is the indigenous INS Arihant SSBN (nuclear powered ballistic missile submarine). These are smaller than other country’s SSBNs but are all the same large boats. The design is largely indigenous but has benefited from Russian assistance and borrows parts of the forward hull design from the KILO Class. One is in service and has been reported to have started deterrent patrols armed with nuclear warheads. She will be joined by three more boats of a refined design, the first of which, INS Arighat, has already been launched but is not yet commissioned. Original artwork CLICK IMAGE FOR HI-RESOLUTION. Weapons: Large missile: K-4, Smaller missile: K-15, Upper torpedo: TEST-71ME-NK, Lower torpedo: 53-65K. India has gained experience operating nuclear submarines with boats leased from Russia. The current example, INS Chakra, is an AKULA Class SSN. She is undoubtedly the most powerful attack submarine in the region. There have recently been reports that India will lease a second AKULA Class following the retirement of this boat. In the 1980s the Indian Navy looked to Europe for submarines and help further developing indigenous production. The first Western type was the German Type-209/1500. Four boats entered service in the 1980s-90s, with the first twi built in Germany and the last two in India. 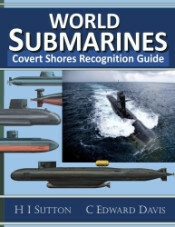 The latest European purchase are French designed Scorpène class conventional submarines, known locally as the Kalvari Class (the same name was given to the first batch of FOXTROTs), which will replace the ageing KILOs. Ultimately six Scorpènes will enter service. Currently one is in service and a second is expected to be commissioned in the coming months.